Complete your game room when you add a MyT Indoor ping pong table. Table top is constructed of MDF ranging in thickness up to 1” board for perfect ball bounce. Surface is finished with a repeat roller coating in matte color with gloss perimeter lines to offset the look. Revolutionary storage pockets are built right into the table frame. Pockets for ping pong balls and rackets are in each end of the table to allow easy access to table tennis equipment. Ball pocket holds up to 8 balls while racket pockets hold up to 2 rackets each. made of powder coated steel with folding capability designed to allow for solo play. The sturdy folding frame features an automatic gravity locker and wheels for easy moving. Wheels also have brakes to keep table locked in position. Table feet are adjustable for a perfectly level playing surface. 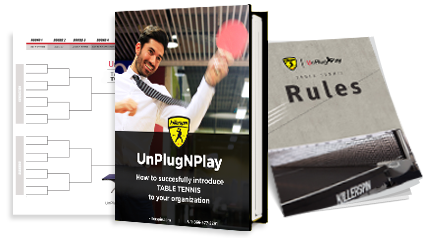 Killerspin’s entire line of regulation size indoor table tennis tables was created with a single goal in mind; to provide a premium customer experience. This goal is embodied by the high quality materials used and construction techniques employed, is tangible in the superior playability of the table tops, is clear in the functional storage pockets and is backed by our helpful concierge and customer service team. From our tournament-quality MyT10 Pocket table tennis tables to our anything-but-entry-level MyT4 Pocket ping pong tables, you’ll receive the same high level of attention to detail across our entire line of standard size tables. All full size MyT Pocket Indoor tables include two special storage pockets on each side of the table. These pockets hold ping pong balls and paddles within easy reach of both players, helping keep rallies going and precious equipment protected when not in use. The ball pockets each hold eight balls right where you need them, and the paddle pockets protect two paddles each for those rare times when you're not playing. The premium two-piece folding design of gives you the flexibility store your table in tight spaces, such as behind a door. When folded, each official-size MyT Indoor tables take up only 60in. x 64in. x 24in and can easily be wheeled into place with their oversized locking casters. Plus, you get the added benefit of being able to fold one side up and transform the table into playback mode, allowing you to warm up solo or work on your game without an opponent. You'll never have to search for an opponent again. They do all this while still maintaining the regulation size of 274 cm. (9 ft.) in length, 152.5 cm. (5 ft.) in width and 76 cm. (2 ft. 6 in.) off the floor. Each professional quality MyT Indoor table tennis table has its own sweet spot. The MyT4 and MyT5 tables are perfect for beginners casually playing in the garage or basement. Stepping up to the MyT7 tables, the ideal users would include offices, schools and recreation centers that put the table through a little more play, wear and tear. Sitting at the top of Killerspin’s MyT Indoor line of folding ping pong tables are the MyT10 BiancoPure, BlackPocket and BluPocket tables. These tables feature a full, professional size top similar to that found on the ultra-premium Revolution series, in a foldable and storable design. 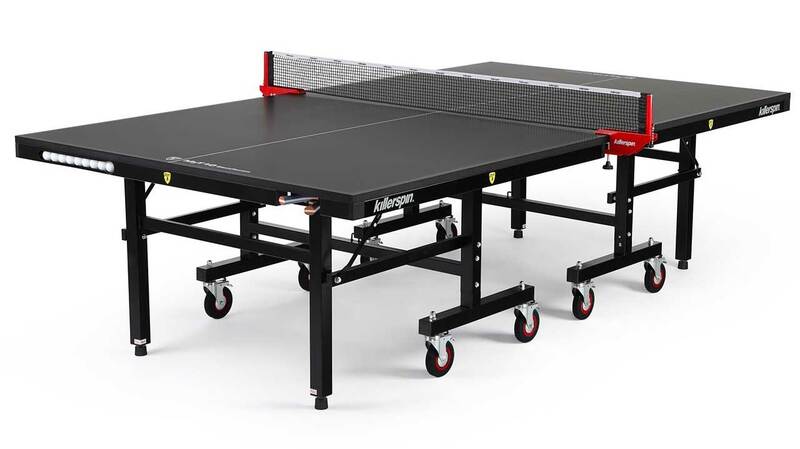 This table is at home in table tennis clubs with serious competitors and is the perfect option for serious tournament and professional-level play. Alternatively, it's also a great choice for families looking for an indestructible table for rambunctious kids and fun competition.